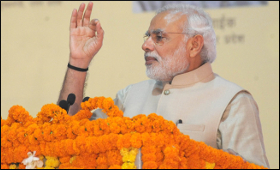 Prime Minister Narendra Modi on Friday said uplifting backward districts of a region will transform the entire state and urged government officials to challenge themselves by taking postings in those districts. Modi said that by creating success stories in such backward districts -- which he dubbed the aspirational districts -- an environment of confidence would be created among people who would start believing that anything is possible. "Once the people of India decide to do something, nothing is impossible," Modi said at a conference on "Transformation of Aspirational Districts". "Serving in less developed districts may not be glamorous but it provides a massive opportunity to bring a positive difference through innovative means. "On April 14, we celebrate the jayanti of Babasaheb Ambedkar. Let us devote these coming three months to pioneering innovation in the less developed districts and transform the lives of the poor," Modi said. He said that relative backwardness of some regions is an injustice to the people of those regions. In that context, he added, this effort to develop 115 backward districts, is in keeping with the vision of Dr (B.R.) Ambedkar, who worked for the upliftment of the under-privileged. The NITI Aayog has identified 115 aspirational districts from different parts of the country which the government intends to transform by 2022. Modi added that uplifting the aspirational district of a region will transform the entire state and one could start with achieving low hanging fruits to create success stories to build confidence and motivation. "We need to identify existing aspirations in the districts and channelise them to create a ripple effect for transforming them," he said. "Imagine the transformational change across the nation once our identified aspirational districts start taking 10 steps forward." Modi said that while some officers are reluctant to take postings in those areas which are thought to be backward, "those who get to work in our aspirational districts are fortunate to have an opportunity to create great achievement and satisfaction in their life journey". The Prime Minister said that all-round and inclusive development was essential as even in the states with strong development indicators, there would be certain areas which would need greater push for development. He said that regional imbalances should not be allowed to increase indefinitely. "Therefore, the development of backward districts is imperative. Success stories are vital to change the negative psyche and mindset in these areas. The first step is to convert this mindset of pessimism into one of optimism," he said.